To use Podcasts 1.0 you will need an iPhone (3GS or newer), iPod touch (third-generation or newer) or iPad (any) running iOS 5.1 or later. Syncing podcasts to a Mac or PC requires iTunes 10.6.3 or later, as well as a Wi-Fi or 3G connection. That said, if you have set up iTunes to automatically sync podcasts downloaded on your Mac [sic] to your iPhone, iPod touch or iPad, it will list those items in the new Podcasts app. Contrariwise, if you haven’t set up automatic podcast syncing in iTunes on your computer, the Podcasts app won’t even list your subscriptions. However, with syncing set up, not only do your existing subscriptions automatically populate, you can listen to a podcast on your iPad and then pick it up seamlessly on your Mac, and vice versa. When it comes to finding content, you can’t browse the full iTunes Podcast Catalog within the Podcast app itself — tap the “Catalog” to do that. This, however, kicks you out to the iTunes app — an inelegant way to do things, but more on that in a minute. Scrolling in two directions and many icons don’t load, not exactly intuitive. 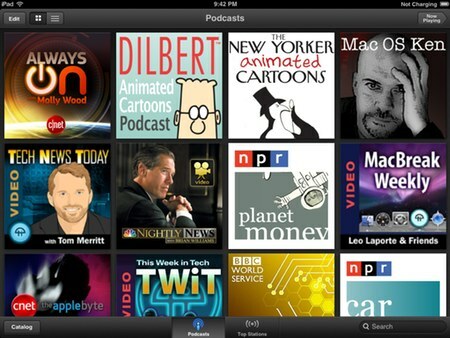 Browsing Top Stations, Apple’s recommended podcast listing, is a hit and miss experience. That is, browsing is structured so that you can simultaneously side scroll (left to right) through podcast categories and subcategories (i.e. Arts: Fasion & Beauty, etc.). The miss here, though, is that checking individual podcasts requires you to scroll down and, given that many of the icons aren’t showing up, you don’t know what you’re looking unless you tap the “i” (i.e. information) button. There’s also no way to how many items are available in a subcategory — sometimes two or three, sometimes more — until you bump into the last podcast. Howwever, individual stations are, in fact, individual podcast listings and not stations per se. So, whereas you will come across TWiT’s iPad Today, that listing doesn’t tie into the TWiT Network’s more than a score stable of podcasts. To locate TWiT, 5X5, CNet, G4, etc. 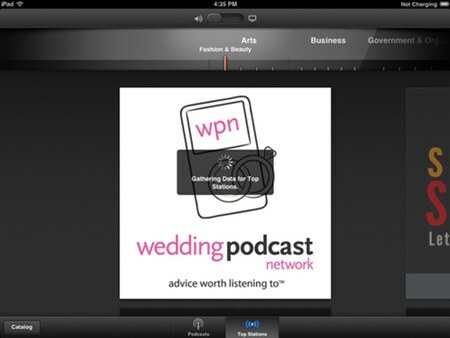 network podcasts en masse, you must tap the Catalog button, which kicks you out to iTunes. When you subscribe to an individual podcast, back you go to Podcasts — lather, rinse and repeat for each podcast you subscribe to, inelegant. For folks with higher capacity i-things, you can configure individual shows to download automatically. When playing an audio podcast, tap the avatar to reveal the above skeumorphism. 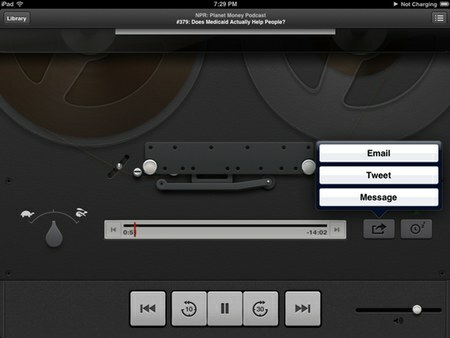 Another (potential) compromise is the display of video podcasts. Yes, audio-only podcasts get played within the Podcasts app and you can watch the above skeumorphic reel-to-reel deck (!!!) go through the motions. Podcasts has been very inconsistent in how video playback works. Sometimes, and I can’t get a handle on what the variable is, video podcasts only play as audio regardless of whether or not they’re fully downloaded, streamed and/or synced from my Mac. Right now, it’s working well and I am smiling. If you have difficulty — make sure you’ve downloaded and/or sync first — then you’ll need to leave Podcasts, navigate to the iOS Video app and view it there — not intuitive, not seamless, but it gets the job done. Yes, this is a version 1.0 app and there’s plenty of room for improvement, notably video podcast playback as well as finding/subscribing to new podcasts. For what it’s worth, Stitcher (free podcast app) users will want to stay where they are.